The explosive seventh installment in the Amaranthine series brings blood, ruin, despair, and hope, for even in the darkest night there is still a moon. After the battle in Indonesia. Katelina wakes in Samael’s domain. Though her memories are tattered, she knows someone is missing: Jorick. 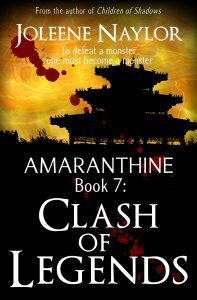 Her vampire lover gathers an army to save her from the ancient, but his master Malick interferes. For five hundred years Malick has manipulated and ruined Jorick’s life. When he leaves Katelina broken and bleeding in the bowels of his oasis, it’s the final straw. While Malick sets up his glorious war with a living legend, Jorick plans the ultimate taboo: to kill his master. He’s tried before and failed. Will this be different, or will he and Katelina be crushed in the carnage of a greater battle, between two whose blood goes back millennia? My Review: Katelina, Jorick, and my other favorite vampires are back in what is probably the best book in the Amaranthine series. I know, I know. I say that about every book in this amazing series, but that's because this series keeps getting better and better. Clash of Legends starts out strong with Katelina going from one dangerous situation to the next, and with a huge surprising twist early in the story. No, seriously! You really won't expect this. Not in a million years. Katelina is no longer the scared, confused young woman we met in the first book. She's grown accustomed to this crazy world she's a part of. While she doesn't always agree with Jorick's "adventures," she's not a passive participant. Katelina is independent and brave, and these qualities have earned the grudging respect of many. She's even made a few of her own friends along the way. Naylor kept me on my toes the entire book. The fast pace plot barreled toward an incredible ending. The only thing I didn't like about this book is that it's over! I can't wait until the next book. I need more Amaranthine! The 7th book in Joleene Naylor's Amaranthine series is finally here. This is easily one of the best vampire series I've ever read. If you love old-school vampires, you've got to try these books! Tricia Drammeh was kind enough to review Clash of Legends. Check it out, and be sure to check out the many awesome posts on Authors to Watch! Yay! So glad you enjoyed it! Thanks so much for the awesome review!